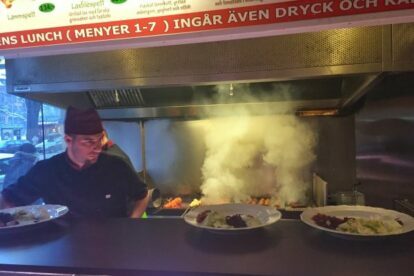 You are hungry and happen to be on Södermalm, the largest of the 13 islands that make up Stockholm, you need to eat soon before irritation makes you say something you’ll regret. May I introduce you to the place that will not only leave a smile on your face but will keep you coming back for more. At Amida Kolgrill the skewers have slowly been turning since 2002 when one of the first establishments dedicated to the Mediterranean-style grill opened in Stockholm. Adana kebab is my favorite dish here: a spicy minced lamb kebab from the south of Turkey. The meat carries a smoky aroma that can only be achieved when grilled over live coal. And you can’t go wrong when ordering Alinazik, where finely chopped lamb is combined with grilled eggplant, served with yoghurt and garlic. Amida Kolgrill has been a successful venture having attracted loyal followers who value great food and affordable prices. Add friendly service. The restaurant has expanded their original premises on Södermalm, and in addition, opened another one with the same name on Kungsholmen.